The words tab replaces the v5 Common Words view. From v7.5.0, the word cloud acknowledges both the built-in stoplist and document's own stoplist note, if present. The scope shown in the pane is equivalent to the export output of ^documentCloud^. 'Scale' slider. The view can be magnified or reduced by dragging the dragging the slider. Image. A word cloud of the most common words found in the current scope. The words are drawing in $NameFont. Re-sizing the pane causes the layout of the contents to be re-arranged. Image copy. Right-clicking on the word cloud allows it to be copied to the clipboard as an image. 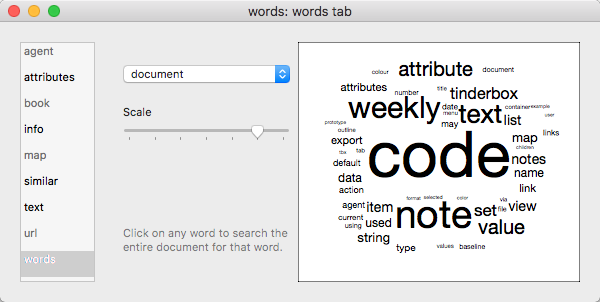 The data is actually in vector format, so if pasted into an image editor capable of vector-based editing the individual word elements are accessible (Mac Preview has limited such support). If passed to a normal bitmap editor an image the size of the image in Get Info is created. Search. Click on any word and a Find pop-up based on that word is opened. The find is always whole-document scoped.